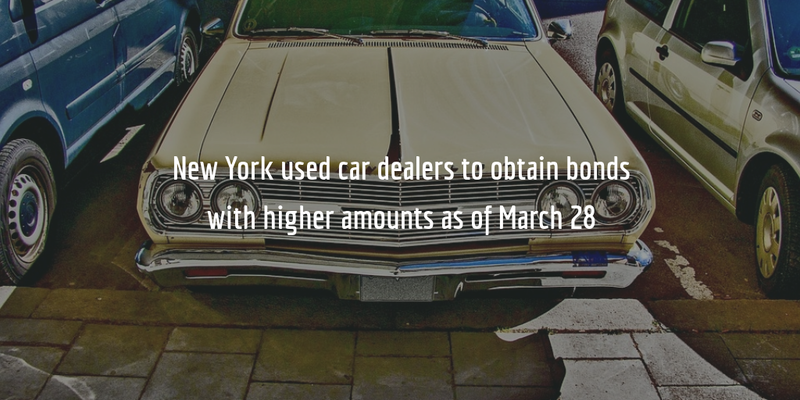 New York used car dealers should remember that they will have to obtain bonds with higher amounts starting March 28, 2017. This change was implemented with the passing of New York Assembly Bill 8166 on September 29, 2016. Read the full details of the new requirements, and when and how to obtain your New York auto dealer bond! The Bill does not require car dealers who already have surety bonds in place to increase their amounts as soon as the legislation enters into force. Instead, used car dealers will be expected to obtain a bond in the new amounts when they renew, replace, alter or extend their current surety bond. So what about the cost of such bonds? How much will used car dealers have to pay for a new bond? The cost of your surety bond is a percentage of the total amount of the bond. That percentage, or rate, is determined by the surety bond company which issues your bond. The process goes like this: when applying for an auto dealer bond at a surety bond agency, you will be asked to provide financial details, such as your personal credit score and maybe some financial statements, proof of assets and more. Your personal credit score is the most important factor influencing your rate. Applicants with a high credit score can expect to get a quote that ranges between 1% and 3% of the full bond amount. Applicants with lower scores can also obtain a bond through our Bad Credit Program. The increase in used car dealer bond amounts will also increase bond cost for dealers. This has been a source of criticism towards the state of New York as it will be putting smaller car dealers in a difficult situation. Typically bond increases of such a level are not made without scrutiny on behalf of legislators. A common reason to increase bond amounts is that there is a history of insufficient compensation on bond claims, requiring a general change in bond amounts. Car dealers can have an impact on the rate of their bond though. By improving their credit score over time, showcasing their finances and assets, and working closely with their surety bond company, dealers can get lower rates every time they renew their bonds. If you need more information regarding the increase in the amounts of New York car dealer bonds, call us at (877)-514-5146 to speak to one of our experts!